Assigned status Up to Date by Maria A. Woodward, MD on February 17, 2017. Herpes Zoster Ophthalmicus (HZO), commonly known as shingles, is a viral disease characterized by a painful skin rash in one or more dermatome distributions of the fifth cranial nerve, shared by the eye and orbit. Herpes Zoster Ophthalmicus is an ocular disease which usually manifests as a unilateral painful skin rash in a dermatomal distribution of the trigeminal nerve shared by the eye and ocular adnexa. HZO occurs typically in older adults but can present at any age and occurs after reactivation of latent varicella-zoster virus (VZV) present within the sensory spinal or cerebral ganglia. HZO is caused by the varicella-zoster virus which has re-activated from its dormant status in the dorsal ganglion cells of the central nervous system. From there it may travel along neurons to the sensory axons of the skin to form vesicular lesions. HZO is a result of activated varicella zoster virus which is a double-stranded DNA virus in the herpes simplex virus group. A varicella-zoster shingles vaccination is now recommended for patients over the age of 60. Although 90% of the population has prior exposure to VZV, there appears to be a benefit to booster immunity especially since the community incidence of native VZV exposure has decreased. During a recent study, a 50% decreased incidence of zoster and 66% reduction of postherpetic neuralgia was demonstrated. Herpes zoster is an acute, painful, vesicular eruption distributed along a single dermatome and is associated with a prodrome of fever, malaise, headache, and pain in the dermatome. The vesicles typically crust and will heal within 2-6 weeks. External examination of eyelids, periocular skin, and scalp. Slit-lamp biomicroscopy of the anterior segment with special attention to any staining cornea defects, stroma opacities, cornea vascularization, keratic precipitates, and anterior chamber cell and flare. Dilated examination of the lens, macula, peripheral retina, optic nerve, and vitreous. 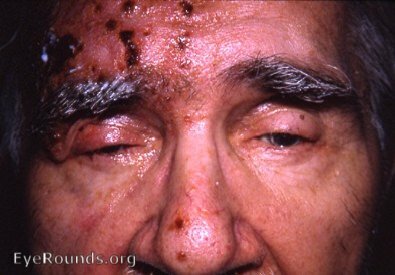 Many cases of HZO exhibit a prodromal period of fever, malaise, headache, and eye pain prior to eruption of the skin rash. The patient may describe eye pressure, tearing, eye redness, or decreasing vision. Pain in the distribution of the trigeminal nerve may be severe. Dermatome distribution pain and rash with associated ocular findings strongly suggest HZO. Cornea epithelial defects, decreased corneal sensation, and ocular inflammation in any of the layers of the eye also correlate with the diagnosis. HZO iritis is frequently associated with high intraocular pressure. Cornea sensation should be tested prior to instillation of anesthetic drops. This can be accomplished with a Cachet-Bonnet anesthesiometer or with a fine wisp of a cotton-tip applicator. Decreased sensation is very suspicious for herpes simplex virus (HSV). Using fluorescein, cornea epithelial defects should be ruled out. Not many disease processes produce a painful vescicular rash. However, other conditions that create vescicular rashes should be considered especially in the absence of pain: for example, contact dermatitis and vaccinia dermatitis. Other disease entities that can mimic cornea findings include recurrent erosion, noninfectious cornea melts, infectious keratitis. There are numerous infectious and non-infectious entities that can exhibit ocular inflammation in the aqueous, vitreous, optic nerve, retina, and choroid. Skin rash treatment should prevent bacterial superinfection. With careful examination inflammation in all layers of the eye should be ruled out and treated with antivirals and steroids if indicated. When a skin rash is the only clinical sign, follow-up care must be directed to ruling out any ocular manifestations that may develop. Oral acyclovir 800 mg po five times daily for 7 to 10 days is the standard treatment. Alternatively, a provider could use famciclovir 500 mg po tid or valacyclovir 1000mg po tid. If the systemic condition warrants or if the patient is unable to tolerate food by mouth then acyclovir 5-10 mg/kg iv q8 for 5 days may be utilized. Topical steroids (e.g. prednisolone acetate 1%) should be used for interstitial keratitis and uveitis. For episodes of scleritis, retinitis, choroiditis, and optic neuritis, systemic steroids by mouth or intravenous administration should be strongly considered. For increased intraocular pressure commonly found in herpes trabeculitis, topical steroids should be administered as well as aqueous suppressants (e.g. timolol, brimonidine, dorzolamide, acetazolamide). Pain should be treated with narcotics if warranted. Neuropathic pain responds well to amitriptyline 25 mg po qhs and can decrease the incidence of postherpetic neuralgia. Capsaicin cream applied to the rash may decrease pain as well. Pregabalin 150mg /day in divided doses may alleviate pain due to acute herpetic neuralgia. Depending on the ocular findings and severity the patient should be monitored every 1 to 7 days during the acute episode. Monitoring every 3-12 months afterwards may be helpful to monitor for delayed sequelae such as ocular hypertension, cataract, and cornea scarring. If there is any concern of future exacerbations, viral prophylaxis should be considered with acyclovir 400 mg po bid. Cornea transplantation is sometimes required for lesions that cause severe cornea thinning and loss of structural integrity of the eye. Scars that are visually significant and refractory to medical therapy and/or hard contact lenses may require transplantation. Vitrectomy/Retina detachment surgery may be performed especially in cases of acute retina necrosis (ARN). Glaucoma filtration surgery is sometimes performed if there are difficulties with maintaining optimum intraocular pressure. If the intraocular inflammation and/or steroid treatment causes a cataract then cataract surgery may be performed when the disease process is quiescent. Depending on the type of surgery performed, the patient should be closely monitored for severe inflammation commonly associated with herpes after surgical procedures. Viral prophylaxis with antiviral therapy and steroids should be strongly considered. Zoster skin manifestations in the eyelids can affect the deep dermis. Therefore, cicatrix can result in ptosis, lid scarring, ectropion, and entropion. Scleritis can cause scleral, limbal and corneal atrophy. Inflammation in the cornea, optic nerve, retina and choroid could result in permanent vision loss. Corneal scars commonly affect the vision requiring hard contact lens or cornea transplantation interventions. Postherpetic neuraligia occurs in 36.6% of patients over the age of 60 and in 47.5% over the age of 70. Prognosis is greatly variable and dependent on long-term sequelae. Long-term vision loss, need for surgery, and long-term antiviral prophylaxis are all possible. Boyd K, Yeu E. Herpes Zoster (Shingles). American Academy of Ophthalmology. EyeSmart® Eye health. https://www.aao.org/eye-health/diseases/shingles-herpes-zoster-list. Accessed March 13, 2019. American Academy of Ophthalmology. Neuro-Ophthalmology/Orbit: Herpes zoster ophthalmicus Practicing Ophthalmologists Learning System, 2017 - 2019 San Francisco: American Academy of Ophthalmology, 2017. ↑ Liesegang TJ. Herpes Zoster Ophthalmicus. Ophthalmology 2008;115:S3-S12. ↑ Chapman RS, Cross KW, Fleming DM. The incidence of shingles and its implications for vaccination policy. Vaccine 2003;21:2541-2547. ↑ Schmader K, George LK, Burchett BM, et al. Racial differences in the occurrence of herpes zoster. J Infect Dis 1995;171:701-704. ↑ Cohen PR, Grossman ME. Clinical features of human immunodeficiency virus-associated disseminated herpes zoster virus infection –a review of the literature. Clin Exp Dermatol 1989;14:273-276. ↑ Hilt DC, Bucholz D, Krumholz A, et al. Herpes zoster ophthalmicus and delayed contralateral hemiparesis caused by cerebral angiitis: diagnosis and management approaches. Ann Neurol 1983;14:543-553. ↑ Buchbinder SP, Katz MH, Hessol NA, et al. Herpes zoster and human immunodeficiency virus infection. J Infect Dis 1992;166:1153-1156. ↑ Schmader K. Herpes zoster and postherpetic neuralgia in older adults. Clin Geriatr Med 2007;23(3):615-632. ↑ Thomas SL, Hall AJ. What does epidemiology tell us about risk factors for herpes zoster?. Lancet Infect Dis 2004;4(1):26-33. ↑ Oxman MN, Levin MJ, Johnson GR. Shingles Prevention Study Group. A vaccine to prevent herpes zoster and postherpetic neuralgia in older adults. N Engl J Med. 2005;352(22):2271-2284. ↑ Hutchinson J. A clinical report on herpes zoster ophthalmicus (shingles affecting the forehead and nose). Trans Am Ophthalmol Soc 1942;40:390-439. ↑ 11.0 11.1 Zaal MJ, Volker-Dieben HJ, D’Amarao J. Prognostic value of Hutchinson’s sign in acute herpes zoster ophthalmicus. Graefes Arch Clin Exp Ophthalmol 2003;241:187-191. ↑ Burns DA, et al. Rook’s Textbook of Dermatology, 7th Edition. ↑ Kunimoto DY, et al. Wills Eye Manual, 4th Edition. This page was last modified on March 31, 2019, at 06:43. This page has been accessed 427,841 times.